Abby Mosseri’s most recent work features vibrant characterful gemstones, that come together in carefully curated mini-collections. 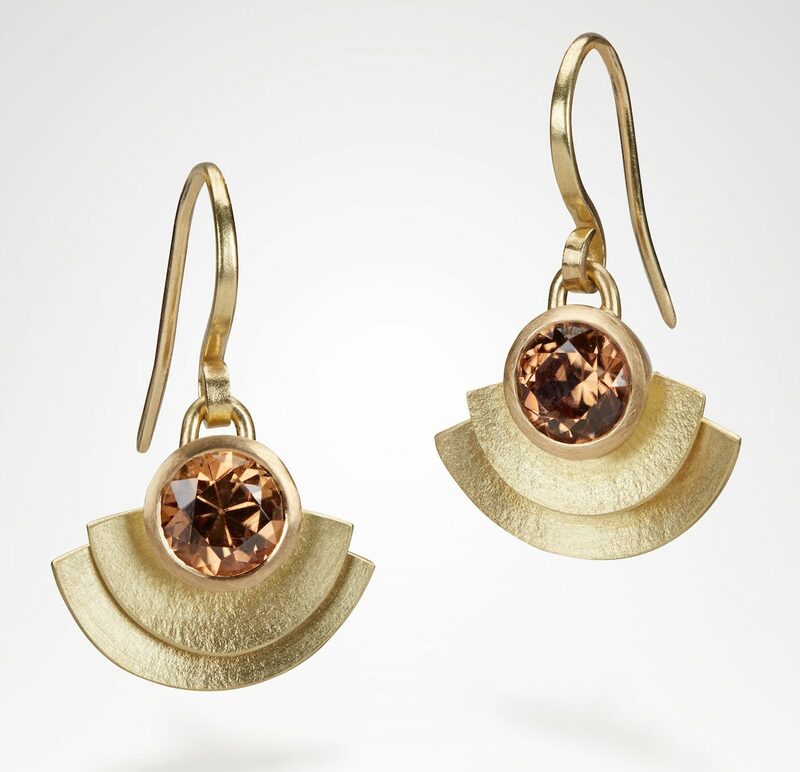 One of a kind pieces are made in delicately textured gold sheet while limited edition collections are forged in solid silver and detailed with gold. Fascinated in the adornments of ancient cultures, Abby references archeological collections, particularly artefacts from Egyptian and Minoan civilisations. 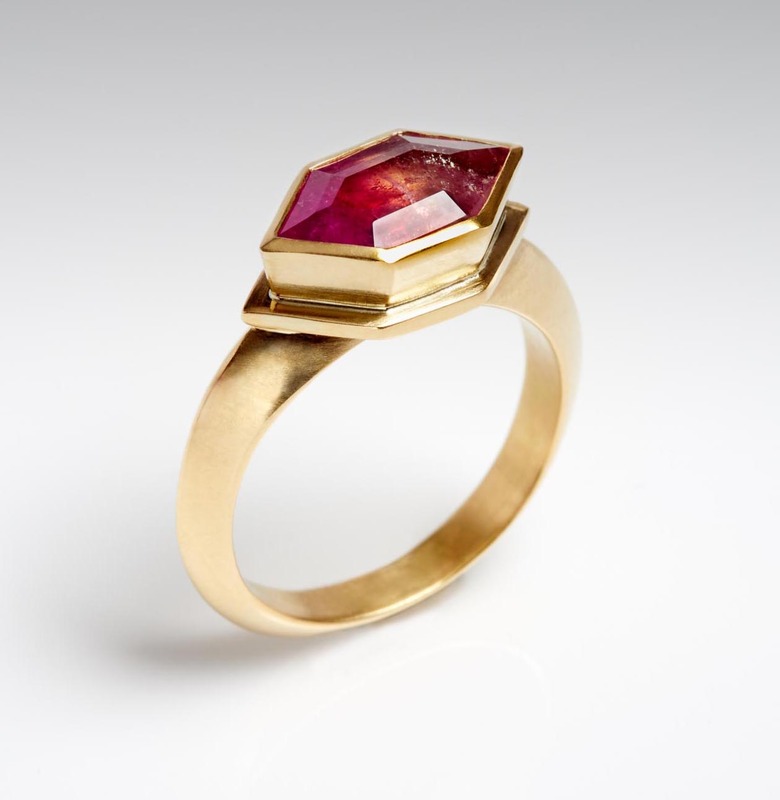 Her distinct work harmoniously blends classical goldsmithing skills with a contemporary, pared-back aesthetic. Individual variations on these colourful designs can be ordered, depending on the availability of particular gemstones. 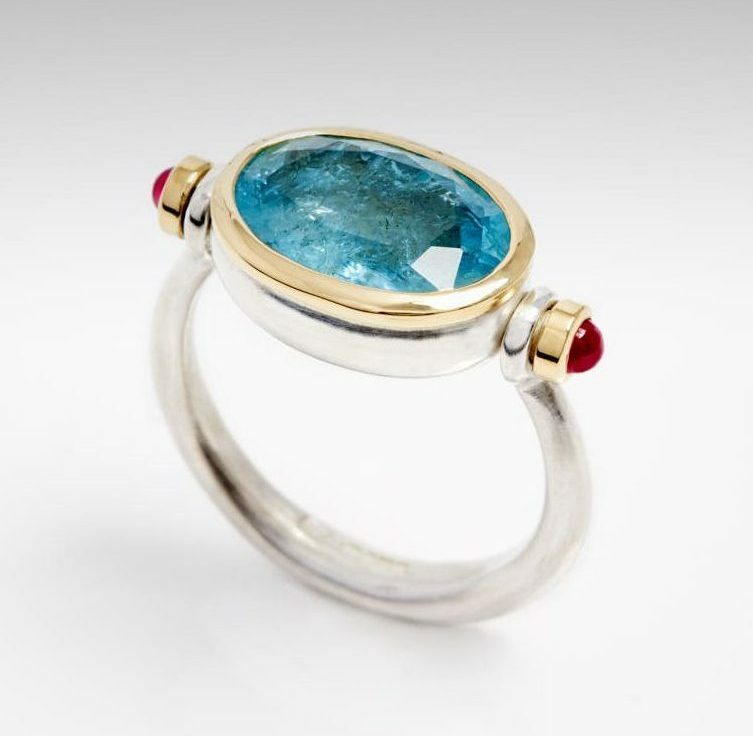 Beautiful Blue Aquamarine, multi inclusions give this piece a lively character. 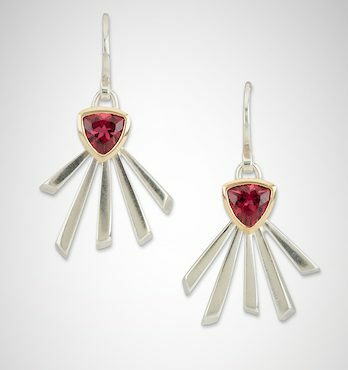 With 18ct gold settings and cabochon Ruby Rivets. Brilliant cut brown Zircon framed in layers of delicately textured 18ct gold sheet. 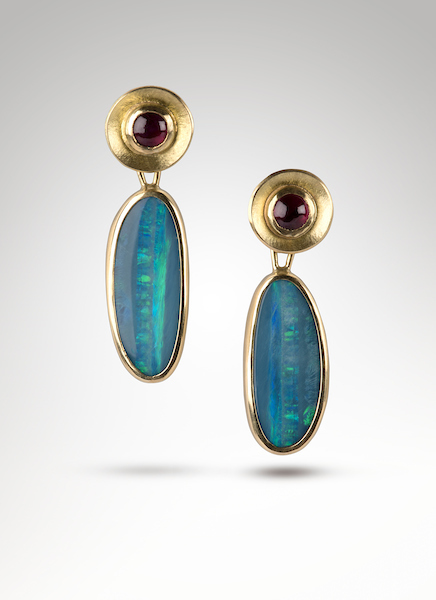 Australian Opal Doublets with Burmese Rubys set in delicately textured in 18ct gold. 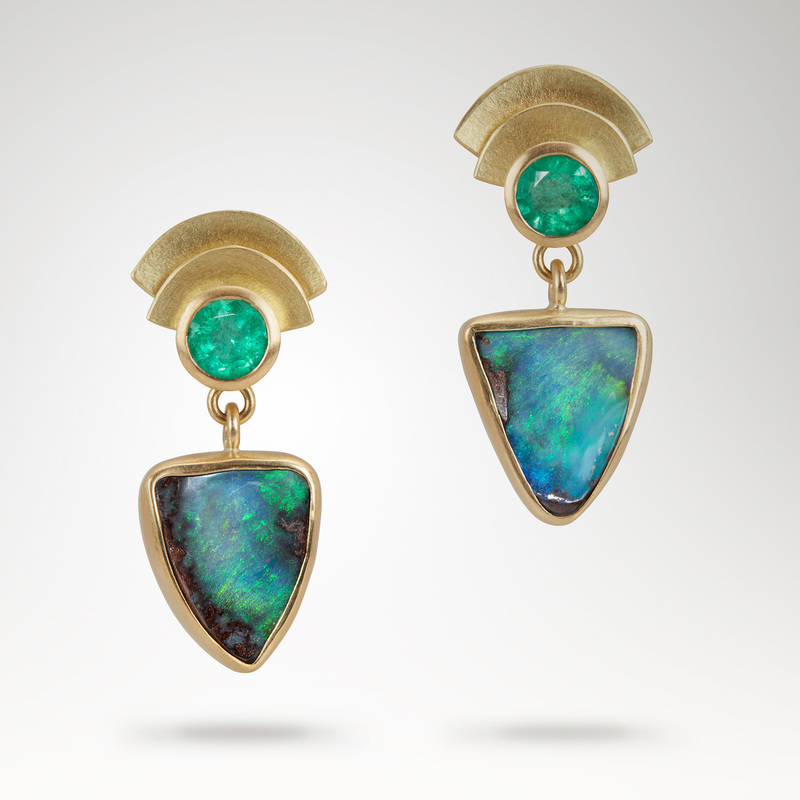 Australian Boulder Opals and Indian Emeralds , a contemporary take on Ancient Egyptian design . 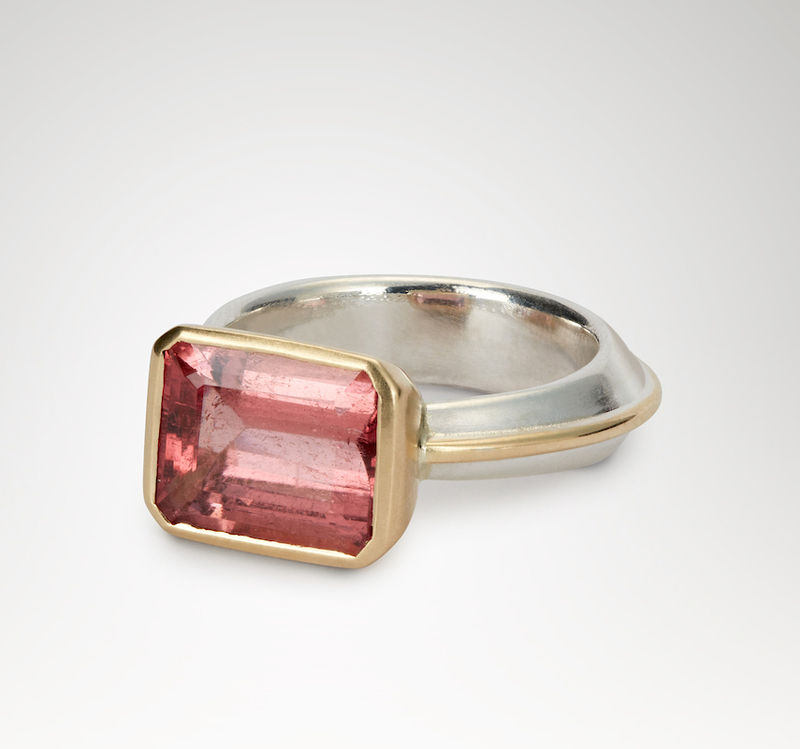 Hexagonal Bi Coloured Tourmaline with a colour range from bright raspberry to pink champagne. Set in chunky 18ct gold on a hand forged angular ring. Trillion Tourmalines set in 18ct gold and detailed with hand forged, tapered, square-section silver . 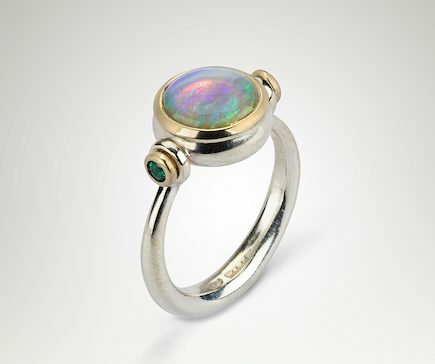 This White Opal has bright pinfire flashes in red and green that dance on its’ surface. Set in 18ct gold and detailed with Emerald rivets. Over 6 carats of Rose Pink Tourmaline set in a weighty 18ct gold setting on a hand forged silver ring with linear gold wire detailing. 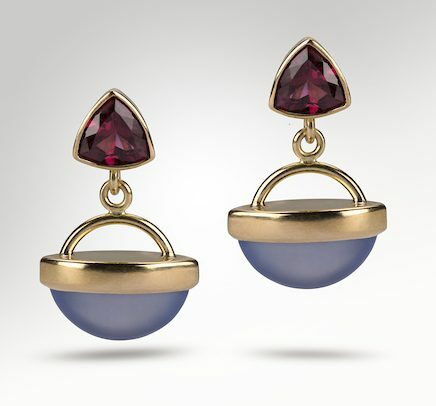 Rhodolite Garnets with Marquise Chalcedony all in 18ct Gold.